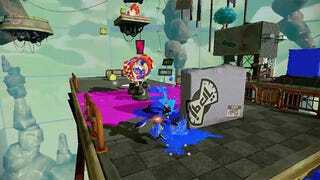 At first glance Splatoon seems to be the love child of a ‘90s Capri Sun commercial and Xbox One’s Sunset Overdrive. That’s... actually... pretty accurate. It’s not often you find yourself playing a shooter that doesn’t feature any bullets, especially one whose titular characters are prepubescent squid people trying to soak each other in colorful ink. But just read that description again. Isn’t that a game you’d want to try? I know I would. Nintendo has a lot riding on Splatoon, and you may have noticed this from how heavily it is being promoted in the media compared to past Wii U titles. The Big N wants a hit. They want a new profitable franchise. I think they just might have found one. 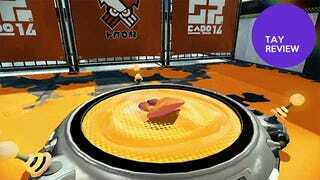 Splatoon is a game based around online multiplayer. It’s the game’s bread and butter. This is new territory for Nintendo though, as most of their multiplayer experiences are focused on local play and not the world wide web. This time the tables have turned and online play has taken the crown. There are two types of online play - Turf Wars and Splat Zone. Most folks are already familiar with Turf Wars, as it was featured in the Global Test Fire demo held earlier in May. For those not in the know, Turf Wars is all about which team can cover the most territory in their team’s ink by the end of a three minute match. Covering ground nets you experience points as a player and gives your team that much more of a lead on your opponents. It’s a blast. One of the best parts is that many times, even when looking directly at the final paint-splattered map, you still can’t tell who won. The matchmaking is snappy and you can even jump into friends’ matches if they are playing online. You won’t be able to pick your team (even when playing with friends), but Nintendo has stated that this feature is coming in August with a massive update. The second type of online battle, Splat Zone, has you once again facing off in 4v4. The difference is that this time there’s a “king of the hill” aspect (dang it, Bobby) that drives the competition. Instead of fighting to paint as much territory as possible, teams are battling to cover one small stretch of land. Which ever team can cover the majority of their spot for 100 seconds is declared the winner. Should no one pull this off a winner is chosen based on who has the lowest number left at the end of five minutes. It’s extremely hectic to battle amongst the inky cluster of seven other players, but that’s what makes it so much fun. It should be noted that this is the portion of the game labeled “Ranked Match” and can only be played after you have reached level 10. The battle grounds chosen for each round, be it Turf War or Splat Zone, are selected at random from the two maps in circulation for that time period. Maps change every two hours, but there were sadly only six to choose from in my review copy. Nintendo assures us more are on the way, and they better be *shakes fist* because I’m already getting tired of a few of them. Overall the online play is delightfully solid. One of, if not the, best online experiences Nintendo has ever created. I realize that’s like being the tallest dwarf, but it’s an accomplishment nonetheless. I never wanted to quit playing, I was just forced to due to everyday annoyances like eating, sleeping and work. Due to the fact that there were only a dozen or so other players on the servers at a time I did occasionally have a hard time filling out a full eight person party, but I’m certain that won’t be an issue once the game hits store shelves. And even if it is you’ll have some throw-back 8-bit squid games to play on your GamePad while you wait. Anyone who managed to participate in one of the four Splatoon Global Testfire time slots already has a good grasp on what the game’s controls feel like. Many already feel the motion controls are a bit too gimmicky to work well in competitive play and I personally agree. But hey, you don’t have to use motion controls! You can turn them off with the touch of a button, and that’s exactly what I did from the get go. Once you get accustomed to the aiming, inking, squidding and general Splatoon basics it’s easy to cobble it all together into more advanced techniques. It doesn’t take long until you’re inking like a pro. The only three aspects of your inkling that you get to pick from the start are their gender, skin tone and eye color. From there on out it’s your job to equip them with the freshest and most powerful gear. According to one of the Sunken Scrolls found in single player, inklings only care about fashion and battle, so you have to be well suited for both. Weapons are unlocked by raising your level in online play, in fact you can’t buy anything in the shops until level four. There are plenty of weapons to choose from and they (mostly) fall under three categories - long range chargers, mid-rage splatters, and close range rollers. Each has its own distinct advantages and disadvantages, as well as special and sub weapon combinations. Sadly, you cannot mix and match special and sub combos, but they balance each other out pretty well on their own. Though I much prefer the basic splatter gun with plenty of range and speed, I tried each weapon I purchased and found each to be a whole new experience. It’s nice to have variety and I look forward to seeing how dedicated inklings use each weapon in new ways. 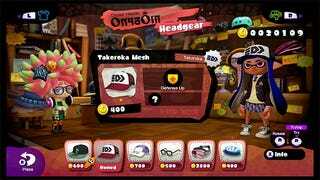 Gear can be purchased and unlocked in three different categories - head accessories, outfits, and shoes. 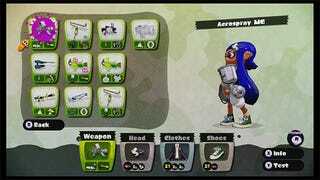 Each piece of gear has at least one special ability that can help improve your inklings’ actions or weapon capacity. Gear is rated with stars. One star means that the gear can earn up to one extra ability, whereas two star can earn up to two. Basically the more stars you have the better your gear can become. These extra abilities are unlocked when you earn so many experience points in online play. Something you were probably going to be doing anyway. It’s pretty obvious Nintendo has taken the time to include quirky and fashionable items throughout the four shops, and it’s highly enjoyable to customize your inkling. Splatoon’s multiplayer-centric appeal is certainly the aspect Nintendo is heavily promoting to the public. Heck, even when they announced the game at E3 2014 it was all about the multiplayer action. With that in mind I approached the single player mode with cautious optimism. It seemed like it was going to be less of a main attraction and more of a side show. Luckily I was wrong. Led by the aging war hero Cap’n Cuttlefish, it is your job as “Agent 3” to take down the alien Octarian threat. Squids and Octarians have been rivals for thousands of years and this time the flying octopi have gone too far. 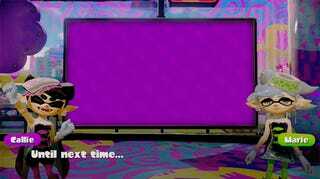 They’ve stolen the ancient Zapfish that powers most of Inkopolis and you must retrieve it. It’s not the most compelling backstory in gaming history, but I suppose it beats Princess Peach getting kidnapped for the millionth time. There are five different floating isles that represent each single player world. Each houses a handful of levels and a boss that must be cleared to move on. Unlike some titles that force you to move from one level to the next in a linear pattern on the overworld map, Splatoon let’s you go in whatever order you please once you’ve arrived at a new world. It also tasks you with finding the invisible entrances to each one. Just finding them can be quite a quest of trial and error. The levels themselves are set up much like Super Mario Galaxy, with floating platforms and islands strewn throughout space. Your inkling squid-hops from one island to the next, which is a very satisfying maneuver because you can rotate the camera and start to shoot mid-jump. Sometimes it’s just fun to look off into the distance to see upcoming obstacles and spy hidden areas. The level design is very well done. Each one features a platforming theme, that are surprisingly under used throughout the single player experience. It is this reason that each level feel very unique, a hard task in a platforming title. Though there are only 27 levels in single player (32 if you count the boss battles), finding all the level entrances and each area’s Sunken Scroll makes it a decently lengthy adventure. It’s not going to stand up to your average Mario or Zelda title in terms of time spent, that’s for sure. I actually think that since many of the levels can be completed quickly and without much enemy interference that Splatoon may become a favorite of speed runners as time goes on. The Sunken Scrolls, as I mentioned above, are the one and only collectable of single player mode. They are scripts that depict the sometimes hilarious and sometimes dark history of the squid people and their daily life. There are some wonderful details and interesting spoilers that I won’t go over here, but be on the look out for a full spoilerific article from me about the Sunken Scrolls in the near future. Splatoon is not a game that takes itself very seriously. This is best proven by its cast of goofy supporting characters. Your inkling is a bit bland compared to the handful of merchants, pop stars and others you interact with throughout the game. I’m not going to ruin any of these encounters for you except one - a tempura shrimp named Crusty Shawn who sells shoes. I want a game just about him. As an avid amiibo collector I’ve sunk an unhealthy amount of time and energy hunting down Nintendo’s highly prized figures. I enjoy amiibo because of their look and not necessarily what they can do in game. That’s mostly because compared to other physical DLC (see Skylanders and Disney Infinity) amiibo don’t unlock much. A costume, a weapon, and in very rare cases a new game mode. I don’t usually feel like they’re worth the $13 price tag, at least content wise. In the case of the Splatoon amiibo I actually do. Each Splatoon figure unlocks 20 specialty missions that take place in the single player levels. Players are tasked with completed levels using unique weapons like the charger and roller, as well as sub-weapons and specials. Every four missions also unlocks a new accessory, weapon or minigame. It’s a nice amount of bang for your buck, not to mention that the amiibo themselves looks fantastic. I hope you enjoy the GamePad, because in Splatoon you use it for everything. Literally every single player aspect uses the GamePad and only the GamePad. You cannot use the Pro Controller or any other set-up unless you are the second player in local multiplayer. It’s a bit strange and at first I was pretty miffed that Nintendo wouldn’t even give me the option of switching. As I played I realized that it was somewhat essential because of how much it added to the gameplay. Things like squid jumping to teammates spots, picking missile strike locations and tracking enemy positions are all ways the GamePad integrates G=game play into its little single-touch screen. I still think the option of other controllers should exist and there are plenty of ways you could work around many of the ways the GamePad helps you, but for now I’ve grown to enjoy using it when playing the game in any mode. I take that back. I do I have one big gripe. You can’t play single player or online multiplayer using only your GamePad screen. You have to use the television, and this is kind of a pain in my household. I love to play titles such as Mario Kart 8 and Smash Bros on just the GamePad, while my wife watches TV, but this is not an option with Splatoon. Once again I think it harkens back to the whole “THIS SECOND SCREEN IS IMPORTANT!” mentality the game shoves in your lap. Though how hard would it be to simply let me swipe over to my map and back again if I needed it? Not that hard. Patch that one up, Big N.
In mid-April Nintendo announced that Splatoon’s highly promoted online mode would not have online chat due the negative connotations that normally come with yelling at strangers over the internet. This, of course, sent the denizens of the internet into a tantrum, as just about every well known shooter in recent memory has supported this feature. I too was disappointed that I wouldn’t be able to talk to my buddies while we painted the competition. After many hours of online play I can say that it’s not much of a loss. At least it doesn’t seem to be. With the GamePad map you’ll know exactly where everyone on your squad is and what they are currently splattering. Maybe it would be a nice addition in the future, but for now I have enough to focus on without people screaming in my ear about the fact they just got bulldozed by a roller. The city of Inkopolis is the central hub of all things Splatoon. It houses every shop you will buy from and every mode you’ll want to experience. The city also, assuming you’re connected to the interwebs, will display other inklings you’ve met online walking about the city. You can read their Miiverse posts and check out their gear as they stroll the streets. It’s actually a pretty great way to interact with other players and a helpful way to find items you may have missed in the shops. The only part of Inkopolis that makes it seem useless is that aside from the Miiverse folks walking all around, you can access all the game has to offer from the GamePad menu. If you want to buy a fresh new pair of sneaks you can walk your squidy self over to the boutique and saunter on it. Or you can touch the store’s logo on the GamePad. It’s nice that you have the options, but one of them is much more accessible. It’s hard to nail down what type of music Splatoon has. It’s kind of like ska meets synth pop meets thrash meets punk rock meets Peter Frampton when he does that thing where he talks with his guitar. Some songs are very angry and intense, while others are upbeat and joyful. When people are singing (I use that term loosely) there’s no audible english. It all sounds like gargled Japanese mixed with squidy sploops and pops! It bridges the spectrum from somewhat annoying to toe tappingly catchy. What song you get is a gamble, so hopefully you’re saddled with a winner. Nintendo is the undisputed king of couch co-op and local multiplayer madness. Over the years they have developed some of the most enjoyable living room experiences with series like Mario Kart, Mario Party and Super Smash Bros. This is why it’s such a shocking disappointment that the Big N dropped the ball on what could have easily been another classic title in their offline multiplayer lineup. What makes it so bad, you ask? Quite a few things. Let’s start with the fact that the game can only handle two players at once. Not three. Not Four. Not eight (you could do that in Smash Bros for Wii U). Only two. Not only can you just play with one other person, the game doesn’t even give you the option to play in split screen. One of you, who ever has the GamePad, is forced to play only on GamePad. This is the same bizarre concept that Nintendo applied to Hyrule Warriors and while it works out alright, it’s just not ideal in many cases. Surely they could add in the ability for more folks to play together in the comfort of one room. The second big mistake was only letting players choose one game mode. Is it the awesome Turf War? Nope. Some kind of ink battle purely based on kills? Nada. It’s a balloon popping game. There are balloons and you must pop them with ink. But then sometimes there aren’t any balloons and you just have to fight each other over the spot where the next balloons are going to be. It just feels... lame. There you are with one other person on this huge map and all you’re doing is trying to pop balloons and stop them from popping balloons? What a waste. The third issue that haunts the multiplayer Battle Dojo (sorry this is so long winded) is the fact that there aren’t any CPU opponents. Not a one. The two player-only aspect of local multiplayer could have been saved by pitting you both against some well tuned computer opponents in a Turf War or a fight to the death based on points. “But GBD,” you say, “maybe they didn’t have enough time to program badass CPU players for you to fight against.” That’s what I thought initially at first too, but then I ran into the Octolings. These inkling clones are some of the most difficult enemies you face in single player and they are identical in all aspects of combat. They shoot, they throw grenades, they hide in ink and evade incoming strikes. They are badass CPU players. Why in god’s name are they not somehow included in local multiplayer? I may have overdone it on this rant of a point, but darn if I wasn’t the most disappointed with this aspect of the game. You can fix this, Nintendo. I don’t even think it would be that hard. You NEED to fix this. It may shock you to learn that there are plenty of folks out there who do not have access to the internet in their homes. Or maybe they do, but their connection is less than stellar and can’t support online play. This is much more common than you would imagine. There have been dozens and dozens of games in the past that have required players to be connected to the web in order to play, but they usually reside on more adult oriented platforms like PS4, Xbox One or PC. It’s simply not the norm for a Nintendo title, especially one that is targeted at children as well as adults. The online play of Splatoon is great and it’s easily the part of the game that has the most replayability. You are also unable to upgrade your inklings looks inside the game if you are without an internet connection, as all the shops update with items through the web. This is why it’s such a shame that the local multiplayer is so awful, and that the single player is on the short side. Without access to the online aspects of Splatoon it’s simply not worth the full retail price of $60 and I fear that many families won’t understand this before purchase. If you have a Wii U and a decent online connection you owe it to yourself to at least try Splatoon. I’m not a fan of the shooter genre, but I’ve fallen in love with the bizarre sea-based world that Nintendo has crafted. I will admit that the game does feels like it was rushed out the gate to reign over the summer lull. That being said, there is still plenty to do until we get the promised updates in early summer and August that will feature new modes, weapons and gear. Many of the worst parts of the game are things that could be easily patched by Nintendo in the coming months and I pray they are listening when I say that. It’s a highly enjoyable game, and it looks like it’s only going to get better.